Welcome! This is the place to download the free digital report. To learn more about the book in process, and find please go here. On that page you'll also find excerpts, updates and interviews with those featured in the book! Since 2010 veteran journalist Jay Walljasper has chronicled the boom in bicycling and walking in a wide variety of appearances and publications, ranging from Christian Science Monitor to Huffington Post to Mother Earth News. This year he teamed up with Pedal Love to write the story of the growth of the modern bike movement over the past twenty years, and how that has brought us to 12 exciting reasons bicycling will continue to grow in the future. This report is specially formatted to be easy to read on your computer! Download the Digital Version of the Report NOW for Free! Next steps? In November we launch our crowdsourcing campaign to create both the print and ebook for early spring 2018 in time for Bike Month! Please note: the report is completely free of charge - the form will ask you for your organization, and your name and address. Unfortunately we can't simplify this - but it will look like it wants credit card info. LEAVE THAT BLANK. Hit submit and it should give you a link to download which will be live for 24 hours. Sneak Preview - The 12 Reasons Bicycling Will Continue to Grow in the U.S.
Megan Ramey of Bikabout and her daughter Annika by Kyle Ramey. Sydney Garrison by Monica Garrison of Black Girls Do Bike. Jonathan Weinert and Claudia Wasko of Bosch eBike Systems Americasby Allan Crawford. The following people and organizations are just a handful of those featured in the report: Monica Garrison and Black Girls Do Bike Pittsburgh, PA; Maria Contreras Tebbutt of the Bike Campaign Woodland, CA; Long Beach CA's first protected bike lanes, the 2nd Thunderhead Retreat Dubois; WY, Bike Portland, Porland OR, Cynthia Rose of Santa Monica Spoke, Santa Monica, CA; Renee Moore of WABA, Washington D.C.; Maria Boustead of Po Campo, Brooklyn, NY; Mikael Colville-Andersen of Copenhagenize, Copenhagen, Denmark. Jay Walljasper is a writer, speaker and consultant specializing in how to create stronger, livelier, friendlier communities. He is Senior Fellow at Project for Public Spaces and an Urban-Writer-in-Residence at Augsburg College in Minneapolis. His books include America’s Walking Renaissance; The Great Neighborhood book: A Do-It-Yourself Guide to Placemaking; and the e-book How to Design Our World for Happiness. A long-time journalist, he was editor of Utne Reader magazine for many years (during which it was nominated three times for a National Magazine Award for General Excellence) and a contributing editor of National Geographic Traveler, focusing on sustainable cities. Learn more at JayWalljasper.com. 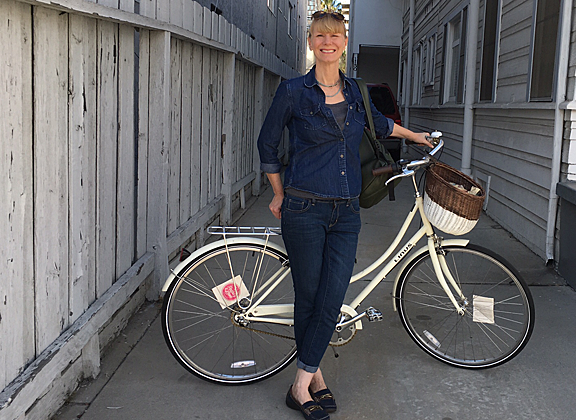 Melissa Balmer is the former Media Director for the California Bicycle Coalition and Founder/Director of PedalLove.org. Her mission is to share the power of personally engaging storytelling to inspire more active, sustainable, mindful mobility from diverse perspectives. As a media relations specialist Melissa has placed Pedal Love and her clients in media such as the Associated Press, Bicycling Magazine, Bloomberg News, Cosmopolitan Magazine, the Los Angeles Times, Momentum Magazine, Public Radio International's Living on Earth, the Texas Standard, Reuters, Sierra Club Magazine, and more. As a writer, marketing and media relations specialist she's worked with City of Long Beach's Bike Long Beach Campaign, the Pro Walk/Pro Bike: Pro Place conference, Metro Los Angeles, the Vision Zero Network, Tempo Bicycles, the Electric Bike Association and others on visual alluring, emotionally engaging communications and events to elevate the voice of active living.